Home » Blog » IASbaba’s ALL INDIA PRELIMS OPEN MOCK TEST-2 LIVE! IASbaba’s ALL INDIA PRELIMS OPEN MOCK TEST-2 LIVE! Attachment to Question PDF and OMR Sheet is given below. If no OMR, then write on a sheet of paper and upload or anyway you like. With Solution link, a Google Form will be uploaded. Calculate your Score on above Parameters and fill the Google Form. Be cautious while filling the form, since once submitted it won’t be available. IASbaba's ALL INDIA PRELIMS OPEN MOCK TEST 2-RESULT, RANK AND ANALYSIS! 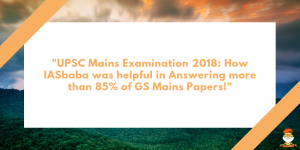 IASbaba’s ALL INDIA PRELIMS OPEN MOCK TEST 2-RESULT, RANK AND ANALYSIS! PRELIMS 2017 Exclusive: ECONOMY- IASbaba’s 60 Day Plan Subject-wise Compilation! PRELIMS 2017 Exclusive: HISTORY – IASbaba’s 60 Day Plan Subject-wise Compilation!